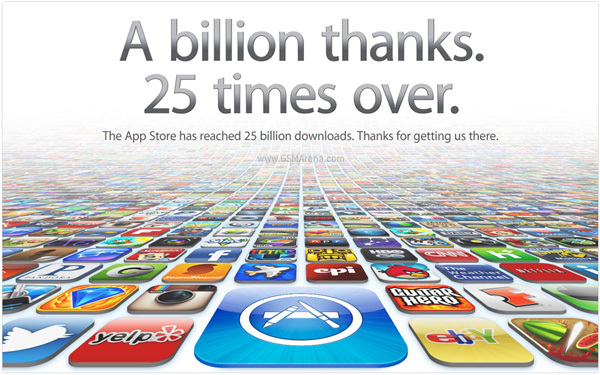 If you've been to Apple's homepage in the past couple of weeks you may have seen the counter for the App Store downloads, which was rapidly approaching the 25 billion downloads mark. Well today, on March 3, 2012, the counter finally crossed that mark, creating a new milestone for the company. But while Apple must surely celebrating this event, it has made sure that it won't be the only one celebrating. That's because as part of their traditional contest, which is held every time such a milestone is about to be crossed, the person who downloaded the 25 billionth app will be getting store credit worth $10,000 to spend on any of Apple's online stores. That's a lot of money to spend only on the store, which means whoever won this prize will probably never have to shell out a single dime from his or her pocket to purchase anything from Apple's store ever again. The winner of this contest hasn't been announced yet but will be displayed shortly on Apple's website. And of course, if you're the winner, you will be contacted directly by someone from Apple.